Item is a photograph of Alex Storm at the drawing board, drawing a segment of the Royal Battery. 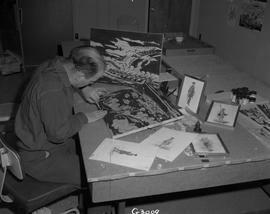 Item is a photograph of personnel member B. Wreford working on woodcuts. Item is a photograph of Bruce Fry demonstrating musket use. Item is a photograph of Captain Des Mantes visiting the Louisbourg Museum. Item is a photograph of a chart of the Fortress of Louisbourg, detailing the names used during the British occupation from 1745-1749. Item is a photograph of a chart of the Fortress of Louisbourg, detailing the names to describe streets and locations in 1745. Item is a photograph of the King's Bastion model at the Information Centre. Item is a photograph of the completed base for a map sign at the Louisbourg Museum. Item is a photograph of the construction of a base for a map sign at the Louisbourg Museum. Item is a photograph of a cut stone model in the Louisbourg Museum. Item is a photograph of personnel erecting a map at the Fortress. Item is a photograph of the erection of the map sign at the Museum. Item is a photograph of guide Doug Arnold telling the story of the reconstruction to Captain Des Mantes. Item is a photograph of the Fortress Information Centre. Item is a photograph of the installed map. Item is a photograph of the belvedere at the King's Bastion from the interior of the Information Centre. Item is a photograph of Kal Hinrikus showing a model of the Louisbourg Lighthouse to Captain Mel Tanner. 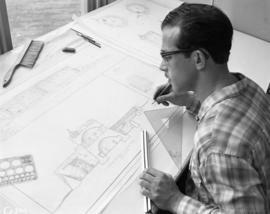 Item is a photograph of Kal Hinrikus working on a model. Item is a photograph of visitors at the Louisbourg Museum on Labour Day, 1964.